Pallets and pallet collars are two of the most important solutions that are used to fulfil all of the requirements of high quality product transportation. You may have heard the term before, but what exactly are pallet collars? And what are the benefits of using them alongside your wooden pallets? What Is A Pallet Collar? 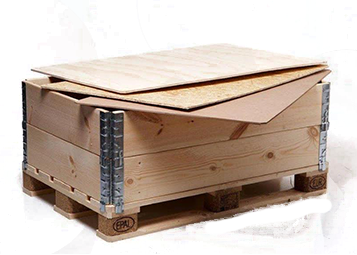 Pallet collars are a modern and efficient replacement for traditional wooden boxes. They can offer the perfect solution to storing, packaging and shipping products which need to stay protected and secure. Constructed from four to six wooden boards with metallic hinges in each corner to hold the boards together. They are placed on top of traditional wooden pallet to form box type storage. No assembly is required, they simply slot securely on top of the pallet and can be easily stacked, which enables flexibility with height at an affordable price. The hinges also allow the pallet collar to be collapsed when not in use. This is one of the main features that has contributed to their growing popularity, especially for space conscious businesses. Their construction ensures that they can be adapted to suit different needs of businesses. Due to their unique design, wooden pallet collars can be a great tool for saving space, both in warehouses and whilst transporting your cargo. By using collars you will also be able to stack your wooden pallet more efficiently without worrying about damaging your cargo. The additional protection offered by pallet collars isn’t just another way preventing damage, it can also make the storage more efficient. Since they are easily collapsible, pallet collars don’t take up any additional space while they are not in use. Another one of the main benefits of using pallet collars is how they can help your business cut costs and save money. Pallet collars can help to reduce the risk of damage to your pallets and products during transportation, meaning you’ll have less replacements and repair costs in the mid to long-term. As previously discussed, they can also allow you to pack your products more efficiently which will enable you to ship more products using less space, again reducing your transportation costs. If you’re looking to reduce your business costs, pallet collars could be a great investment. From storage to delivery, pallet collars are helping companies keep their products safe whilst reducing costs. If you are interested in trying pallet collars, or are simply in need of new wood pallets, Associated Pallets has a wide range of high quality pallets that can be tailored to your business needs. For more information about our products and services contact a member of our team today.